On Monday, June 16, the DOD lieutenants successfully ratified their collective bargaining agreement. The contract is effective October 1, 2007 until September 30, 2010. The new contract continues to foster favorable working conditions, management flexibility and most notably a 3% pay increase for three consecutive years. Photographed (l. to r.) are: Kim Kisslan, Interim General Counsel; Sheriff Al Lamberti; John Puleo, FOP Representative; Col. James Wimberly; Lt. Erich Overhultz, Conte Facility; Lt. Angela Neely, Sheriff’s North Jail; Lt. Jack Santos, Sheriff’s North Jail; and Lt. Ronald Thompson, Conte Facility. Just by looking at her, it’s hard to believe that 94-year-old Dorothy Whitehouse was once a crime-fighting Citizen on Patrol (COP) with the Broward Sheriff’s Office. But yesterday, her legacy was re-lived during a surprise birthday party hosted by Sheriff Al Lamberti. Dorothy was a COP years ago when Sheriff Lamberti worked in the Deerfield Beach district. She became a COP volunteer at the age of 85. 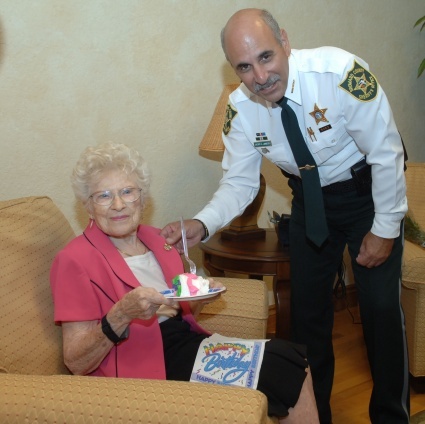 “This is the best birthday ever,” Dorothy exclaimed after being surprised with a cake and flowers from the Sheriff. Dorothy started as a COP in 1995, after a vandal broke a window at her Deerfield Beach home. She worked for five years patrolling her neighborhood, working the front desk at the BSO district office and assisting with community functions. In fact, Dorothy has spent most of her life helping others. She is a retired registered nurse, has volunteered with the blind, physically and mentally handicapped, with girls in juvenile detention centers and halfway houses and at the Humane Society.